Along with the National Heritage Month Celebration, the National Commission for Culture and the Arts (NCCA) recently opened its art exhibition for public. Istorya Ti Luplupa or Narrative of a Village is a title inspired through a story told by a Kalinga elder in Luplupa, Tinglayan Chang-ag Sawad. The exhibition tells the consequences of human actions towards the environment. 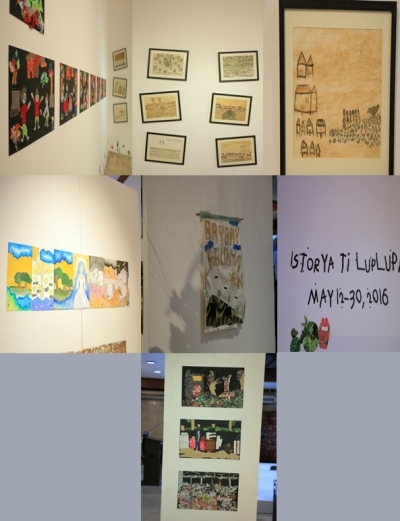 The exhibition is all about the artworks inspired by small stories from small people with huge impact in the society. Its aim is not merely showcasing the talents of young people from Philippine communities but to create an awareness on environmental issues and protection of those untold and unheard stories of the voiceless citizens. Behind creative artworks made by children and other individuals from various communities have its own stories to tell based on true to life situations in the Philippine communities. The artworks are made through different medium of visual arts; from soil pigments, fabrics, paper collages made through magazines and newspapers, crayons, watercolor, down to modern medium of visual arts like photographs, and video documentaries. Visual Artist and community worker Alma Quinto has taught the children through workshops in utilizing different visual arts materials, help them describe their art piece, tell their stories, and produce story books. Environmental concern is the main objective addressed through the artworks. “Dito rin makikita yung gawa ng Marikina, pinag dugtong dugtong ko yung kwento ng ilog, yung Chico River, yung Marikina River, at tsaka yung Ilog Pasig. So mahalaga kasi na hindi lang natin tinitignan yung issue ng lupa kasi nakakabit dito yung issue ng tubig, yung ilog, kasi kung mapuno ang mga ilog dahil sa matinding pag ulan at nagdudulot ng baha atsaka yung pag kakalat na pumupunta sa mga ilog natin. Sino ang mahihirapan? Ang mga tao at sino ang pinaka kawawa? Ang mga bata. “ Quinto said. On the other hand, Mae Quesada, Training and Development Manager of ABS-CBN Lingkod Kapamilya Foundation, Inc explained that after a series of art workshops to the children of River Warriors, volunteers of Paco, Pandacan, and Santibañez for Kapit Bisig Para sa Ilog Pasig, a great idea has been produced in creating their own story books based on the real story described through artworks. “Bahagi ito ng Information Education and Communications Project ng KPBIP last year. Nakita namin na bakit nga ba hindi natin gamitin yung mga kwento mula doon sa komunidad para dun sa pag papalaganap ng issue ng paglilinis ng kapaligiran. Ang maganda dito napakita na pwede pala tayong bumuo ng sarili nating kwento, hindi tayo kailangan bumili ng mga story book .Hopefully, itong mga kwento na ‘to ay gagamitin nung mga bata na naging kalahok dun sa workshop para i-kwento naman dun sa mga bata, sa kanya kanyang komunidad. Ang maganda dito ay pwede pala tayong bumuo ng sarili nating kwento, hindi tayo kailangan bumili ng mga story books.” said Quesada. River Warriors, residents , and volunteers of Esteros de Paco, Pandacan and Santibañez for Kapit Bisig para sa Ilog Pasig; students from Luplupa Elementary School, students and teachers from public elementary Schools in Bauko, Mountain Province, through the Cordillera Green Network; public high school students in Marikina and students from Pamantasan ng Lungsod ng Marikina; students from University of Asia and the Pacific community members of Pook C.P. Garcia, volunteers of Back to Square 1's Off Site/Out of Sight exhibit; Project Bakawan; and young filmmakers, Brian Sulicipan and Christelle Delvo are among of the artists and groups participated.